Summary (from back of Ballantine Books edition): Twenty years ago, Jane Hudson fled from the Heart Lake School for Girls in the Adirondacks after a terrible tragedy. The week before her graduation, in that sheltered wonderland, three people died, all victims of suicide. Only Jane was left to carry the burden of a mystery that has stayed hidden in the depths of Heart Lake for more than two decades. Now, recently separated and hoping to make a fresh start with her young daughter, Jane has returned to the school as a Latin teacher. But ominous messages from the past dredge up forgotten memories. And young, troubled girls are beginning to die again-as piece by piece the shattering truth slowly floats to the surface. -Ballantine Books, 2002. I have a ton of books to read and I've finished reading five of them. I've already prepared drafts for these books and I even bought a book reader's journal. This is to not only organize the books I'm reading, but also a way for me to jot down my initial thoughts on the book in case I get a serious case of writer's block when it comes to these reviews. I sincerely apologize for not being on top of this blog. Life has been hectic for me lately, which hasn't allowed much time for reading. Fortunately, the last five books I've read have been so enjoyable that I am eager to share my thoughts much sooner than I would normally. As always these reviews will be spoiler free. I've decided that Carol Goodman is one of my favorite authors. I haven't read all of her novels yet (I own them all, have yet to read them all), but I have yet to find one I dislike entirely. This one was good and it also challenged me to confront one of my personal phobias. Cutting and suicide are subjects that are particularly squeamish to me. This book tackles both subjects head on. They're certainly not celebrated in the book; rather, they're used as important plot devices. If you've ever heard the phrase "Blood will out", it certainly applies to this book. The blood that is spilt in this book gives clues to past events. Everything, in its own way, in its own time, comes to light. Basic Plot: Jane Hudson returns to her old boarding school to teach Latin. The school triggers memories that she'd rather not remember. Soon, the past appears to repeat itself as events of Jane's time at school replay themselves with the present school population. Jane has to try and figure out who's bringing her memories back to life before anyone comes to harm. Comments: It sounds like a mystery, but the focus of the novel is primarily on the journey of self-discovery, catharsis, and forgiveness that Jane goes through. She has to confront her own demons and forgive herself for past events that were out of her control. Goodwin's appeal comes from writing characters that many readers can identify with in some way - the plight of the outsider, the loneliness of the excluded person, the social politics of teenage girls, and the awkwardness that comes with growing up. I could really immerse myself in their world and connect with them. The plot was well-paced and, of course, it's not a Carol Goodman story without a bit of taboo - real or otherwise. The story flowed well for the most part and I could follow it well. It wasn't at all predictable and I found myself surprised when I reached the end. The only thing I didn't like was the outline of the novel. She writes the story so that it takes place in present time in one section, then, after the section is done, spends a good chunk of the novel in the past. I realize it's in order to set up the past experiences and the important characters of the past, but it just seems too distracting. This is especially true after Goodwin chooses to spend the second third of the novel in the past, then bring the reader right back to the present. I've spent so much time in the past that I have to catch up with the characters of the present. To be fair, it's not like Goodman creates new characters that are never introduced again in later chapters. Everyone and everything is connected. There were no loose ends or remaining characters that had unresolved plot lines. It might not make sense at first, but by the time the novel is finished, everything is resolved and touched on, certain past scenes click with present ones and the reader understands the significance of both. The mystery/suspense elements were done well. There were some moments that had my heart pounding. Goodman does a good job with presenting compelling evidence to suspect certain characters while, at the same time, presenting evidence that would make the reader doubt that character. Nothing was predictable and the final antagonist is surprising, to say the least. I would recommend this book to readers who like books that focus on relationships as well as any mystery or suspense fans. I think the dosage in terms of genre is fairly distributed. The plot, characters, and themes are the driving point of the novel, making it an enjoyable and thought-provoking read. 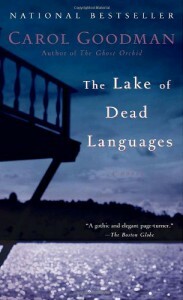 I give The Lake of Dead Languages an A. Please support the author by buying the book from a bookstore, online, or borrowing it from a friend or library.